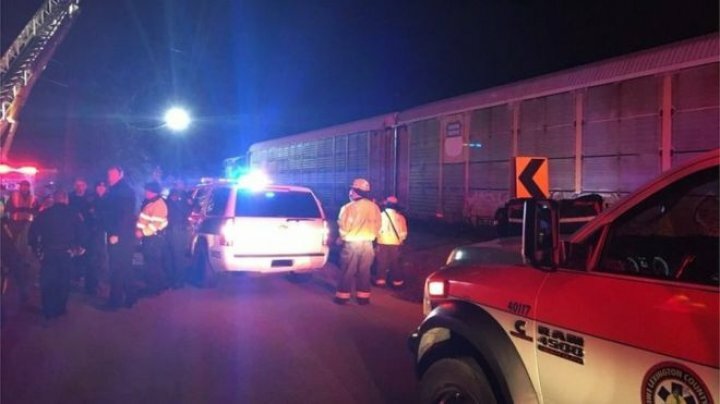 A train carrying 147 people has collided with a goods train in the US state of South Carolina, killing at least two people, officials say. More than 70 people were injured. The train's lead engine and several passenger carriages derailed in the crash, Amtrak said in a statement, wrote BBC. The train was operating between New York and Miami. It comes four days after a lorry driver was killed when his vehicle hit a train carrying lawmakers in Virginia. The local sheriff department confirmed the fatalities in the crash, which happened at 02:35 local time (07:35 GMT) on Sunday in the city of Cayce, just outside the state capital, Columbia. The American Red Cross has sent rescue workers to the scene of the collision, and emergency services say all passengers have been evacuated from the train. A spokesman for the South Carolina Emergency Management Division told reporters up to 70 people had been taken to hospital, with injuries ranging in severity from small scratches to broken bones. According to Amtrak, there were 139 passengers and eight staff members on board the train. It is not known how many people were inside the goods train, run by freight operator CSX. An estimated 22,000 litres of fuel was spilled from the CSX train, but emergency officials said there was no threat to the public. Concerns about Amtrak's safety standards have been raised after a number of fatal train crashes in recent years. Last December, three people were killed when a passenger train derailed after hitting a 30mph (50km/h) curve at 80mph in Washington state. On Wednesday, six people were injured when a chartered Amtrak train carrying Republican lawmakers, including House Speaker Paul Ryan, struck a lorry, killing its driver.